An elite officer in the clone army, the clone commander leads a squad of clone troopers into battle against the Separatist forces He wears a special armor similar to that worn by ARC troopers. 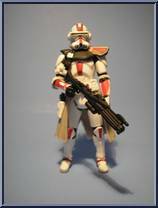 Contribute pictures, update details or suggest corrections for Clone Commander (Battle Gear) (Red). Write a review about Clone Commander (Battle Gear) (Red).